Apple will be announcing its newest iPhone models tonight at 1AM, 13 September Malaysian time. Before it is officially revealed, there’s already a queue in front of an Apple Store. 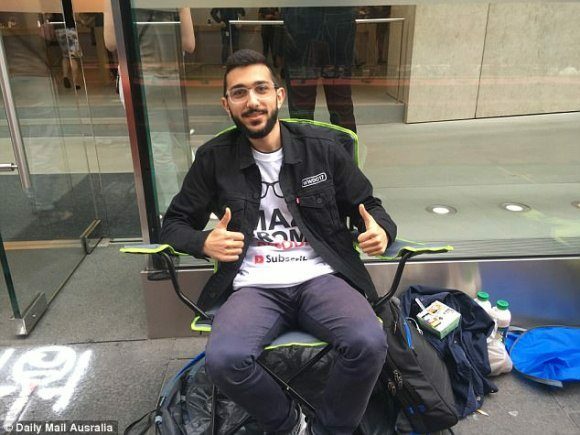 Mazen Kourouche, a 20-year-old student has already set up camp in front of an Apple Store in Sydney, Australia. Due to the time zone difference, he will be one of the first in the world to get the new iPhone since Australia is part of the first wave of Apple releases. This isn’t the first time he has done it. Last year he had lined up in 3rd place and the year before he was about a 100th in line. He’s so adamant to be the first that he wouldn’t give up his spot even when someone offered $50,000. He added that he’s a YouTuber and he will be recording a live unboxing as soon as he gets a unit in the store itself. Since the main event is happening tonight, he would probably need to wait for more than a week. There’s usually a pre-order period before it officially goes on sale. Fortunately, he isn’t alone in his mission as he takes turns with his friends to stay in line. As a student, he still needs to attend classes, so there’s always someone covering his spot. Apart from being a huge Apple fan, he’s also a developer with 8 apps under his name. It was also reported that he was invited to Apple’s WWDC event twice. It is worth pointing out that queuing up in front of a store does not guarantee that you’ll get the model you want. Last year Apple had sold out on its iPhone 7 Plus during the pre-order period which left many in line disappointed. It was reported that several Apple stores had given $100 Apple Gift Cards to make up for their time. Over the years, Apple has made it easier for anyone to order an iPhone for launch day. Apart from physical Apple Stores, you can get it from more telcos, authorised retailers or you can even secure a pre-order unit from their official online store. If you’re eyeing the next iPhone, how are you planning to get it? Are you willing to queue even if you’re not getting additional freebies or benefits? Let us know in the comments below. AD: Something is happening at u.com.my, they could be introducing new unlimited plans just for iPhone. Stay tuned for more news. BBM for iOS and Android Downloaded 5 Million Times in 8 Hours. What does it all mean?